Packed with so much healthy goodness, DEL MONTE Fiesta Fruit Cocktail should be an everyday staple in your home. 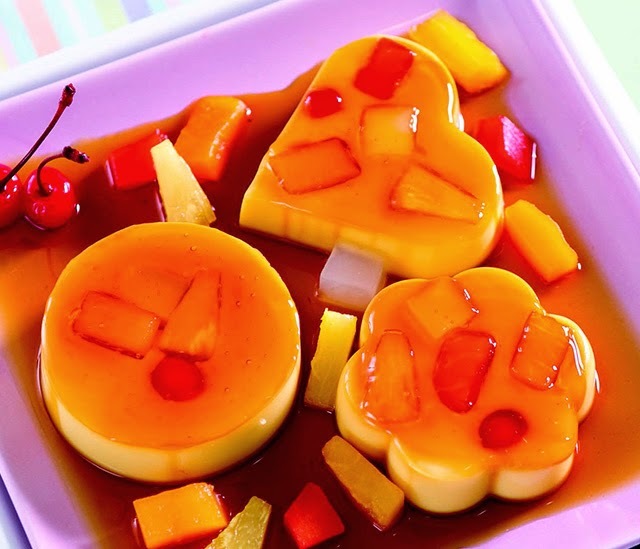 It has a refreshing mix of the freshest fruits— pineapples, papaya, halved cherries and nata de coco—that are great for dessert or snack time. 1. Caramelize sugar in pan. Divide into 3 llanera/molds. Spread fruit cocktail at the bottom of the molds. Set aside. 2. Dissolve gulaman and sugar in syrup-water mixture. Boil until gulaman has dissolved, then strain. Return the liquid into pan. Keep it warm. 3. In a bowl using wire whisk, beat eggs until creamy. Strain on bowl. 4. Stir in milk and vanilla. Mix with gulaman. Cook over low heat with constant stirring for 5 minutes. 5. Add remaining DEL MONTE Fiesta Fruit Cocktail. Pour into prepared molds with caramelized sugar. Cover and chill until set.